World Oil’s proposed construction is overwhelmingly over-the-top when considering bulk and scale and leaves much to be desired when considering compatibility with the existing community character. Sure, the rights of the property owner should not be disregarded, but what about the community for a change? Ocean Beach has many property owners that reap pockets full of income off the expense of our community and with no regard, and with no respect, and with no significant positive contribution to our community. World Oil is not new to the character of Ocean Beach; for many, many years now, they’ve been presenting projects for this property before the community via the Ocean Beach Planning Board, they’ve corresponded with a variety of our community members, they’ve dealt with the city regarding our community, etc. Their corporation knows what would be a good fit, yet they continue to bring incompatible projects. I attended the December meeting and was very disappointed at the logic put forth in some of the decision-making to support the project. For example, a common theme was “At least it is not a gas station”. Are you kidding me?! The gas station project was never approved by the community and was never approved by the city because of the property size and layout, not because World Oil wanted to do us a favor and not build a gas station! Quite the opposite, as they actually tried over and over for years to push through the gas station project. There isn’t a gas station because they were not able to get the appropriate permits! Then I heard exclamations of the plan to house a deli on the bottom floor of the proposed project. I had to ask myself “Why was everyone so excited about a deli?” That specific neighborhood of our community already has Chris’ Liquor Deli, Liticker’s Deli, Ocean Beach People’s Deli, Stephanie’s Bakery Deli. Perhaps a “Deli” isn’t really a “Deli” unless they are a corporate chain? I still can’t figure out that logic of support for the monstrous World Oil project. 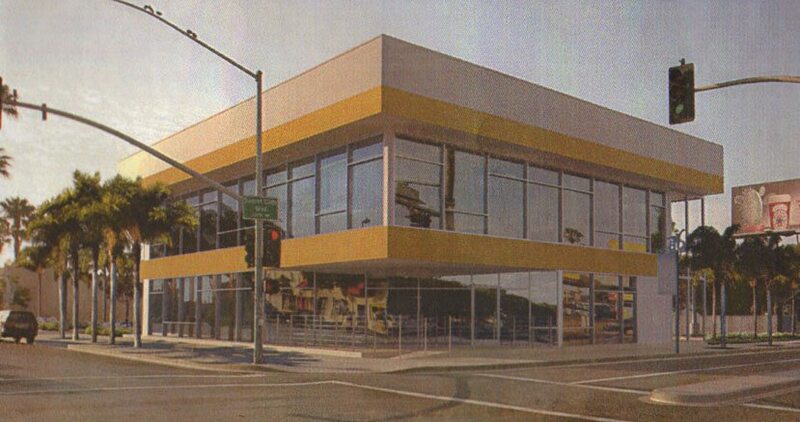 What else….oh, then some stated that this gigantic two-story structure, planned to house a deli and medical offices….I think they even mentioned a pharmacy perhaps (corporate, I am sure)…..that this is exactly what is needed for the Voltaire Street neighborhood. Really?! As we enter the community from the north/northeast, this is the image of Ocean Beach we want shown. A nice “welcome to industrialized Ocean Beach” is what this building will provide. Don’t we already have a surplus of empty spaces for medical offices? As I view the existing Voltaire Street businesses: Ocean Beach People’s Co-operative, Jimmy’s Party Store, The Green Store, Mihn’s Alterations, Stephanie’s Bakery, just to name a few….I just can’t see how the proposed World Oil project is just want Voltaire Street needs, as the project is not unique, doesn’t really provide any services, products, etc, of significance to the neighborhood, will clearly serve as an eye-sore due to the bulk and scale, lacks artistic character, the list goes on…..as I can (obviously) go on and on about this ridiculous project. Once again, World Oil is displaying its disregard to the voices of our community with even bringing this proposed mammoth of a structure for consideration; an insult to the existing community character; an insult to the community as a whole. In the meantime, I sure wish they would be good neighbors and maintain their property, or is neglecting maintenance also their “right as a property owner”? Right on Kim, very well put! Does anyone else find it ironic that this building is going to be on a street named after the writer Voltaire? Neglecting maintenance seems to be the easiest way to fit in with the character of Ocean Beach. Why do we need this building when so many store fronts sit empty as it is? Whoa Brian! Pretty generalized statement there. Does People’s Co-op neglect maintenance on their building? What about businesses like the OB Dog Wash or the new (wonderful) OB Noodle House? Then there’s the many businesses along Newport Ave that work day in and day out to keep their store fronts clean and free of tagging and litter from tourists and punk kids. The only maintenance that has been continuously neglected is that of World Oil’s lot. They bulldozed the community garden so that the area would continue to appear blighted, and the community would eventually agree to put ANYTHING in there so long as we didn’t have to look at a parking lot full of weeds for another year. It’s a pretty good trick. Be careful with the generalizations. Lot’s of hardworking people in this town. You bring to light a very good point, one that I plan on raising at tonights meeting. Many developers go to the city or the coastal commission to pay their fees and assesments before they go to the community planning groups. Instead of being good neighbors and discussing their plans with the community first, they set up this adversarial situation where the local community plan gets to play the bad guy in the process. If the local PG doesn’t accept the implementation (Land Use Code,Coastal Comm. certification, etc.) then the developer can scream that the PG is causing them undue financial burden. So the Plng. Grp. finds it easier to cave in to development interests than to exercise their stewardship obligation to the local community. The requirement that a community plan be a comprehensive long range vision for the future of a community in a collective of communities within the city goes by the wayside. The community plan becomes just another rubber stamp for the developer or as “W” would have it, “just a goddamn piece of paper! So what’s a mutha’ to do? Maybe the city should require that plans first go through the PG before the permiting process. But that might require that local PG members exercise due diligence and the city becomes the rubber stamp. Hippies and Commies and Freaks OH MY! I don’t see anyone recommending tht we just offer whatever the price of the property value from World Oil and just buy the property back (at a recessed value)…certainly this “bohemoth” really just wants to get out of this liability at this point and they obviously aren’t developers of anything but gas stations…they are obviously hiring some bargain designer to try and build an office building (which we don’t need). All of the “whoa is me” and “we can’t fight this” and “its too big” talk on this just is useless. If World Oil wants to go to the city they will and just plow right through the community the way we see so many other gentrification and over-density projects move through. Personally, I’m hoping someone will bring up something new tonight…because neither the board or World oil seems to be listening. The board brought that up at the last discussion and it was even part of the motion that was approved??? right??? Maybe we should be focusing more on what the planning board actually approved and then holding them to that standard? If tonight’s design is significantly changed…then it seems like we are still discussing the whole issue with world oil right? “Every property owner in OB lets their property go to hell.” would be an inaccurate overgeneralization. The presence of hardworking people in OB doesn’t change the fact that there are a number of properties, commercial and otherwise, in OB that are not kept up. To suggest that one neglected property in this community stands out as unusual is, unfortunately, untrue. They’re both generalizations man. Either way, what’s your point? I happen to live in an area where my neighbors keep things up fairly well and I know a lot of business owners that “work hard” to do the same. It just seemed like an abrasive comment to leave up with no real meaning other than to rag on a whole community. I’m sorry you feel that way. No hard feelings though. Boy, everyone is feisty on this board today. Must be too hot out. We should all take a breath and drink a beer. OB beer summit! FWIW, I dig that OB isn’t the sort of place that’s all prim and proper and everything in it’s right place. I’m a laid back kinda guy, I just accept the good with the bad and realize that living in a laid back community means some folks are gonna be “laid back” about mowing their yard, or painting their house, or whatever. To pretend that all of OB is pretty and cleaned up is just silly. I wouldn’t like it if it was, anyway. I agree, and you are of course entitled to your opinion. I saw a guy with a funny shirt recently that had a palm tree and sunset and said, Ocean Beach, “tidy and trendy” He had it specially made for him, and I want to steal his idea it was so funny. Your first comment just caught me a little off guard as I know lot’s of folks here who do not “neglect” their property, and spend a lot of time trying to keep it funky. Thanks for the further explanation of your opinion. I like Lisanob’s suggestion that the property be publicly acquired. Given its belligerently chronic nuisance condition, I believe that it could be purchased through condemnation proceedings maybe with some of that pork-barrell “stimulus” money. The market for commercial property has long been poor and now we are in the Greater Depression; it’s a good time to buy and even better to condemn and buy. Brian you are correct about the incidence of poor maintenance in OB but some of the obvious places on the 4800 block of Voltaire St., for example, are not nearly as noticeable as this corner lot on Sunset Cliffs Blvd. Older Article: Organic Food Is All That, and More. Just Eat It.